It's easy for kids to create and send get well wishes using printable cards. Whether the sick person is another child or an adult, your child can color cheerful message to offer them a little sunshine as they recover. 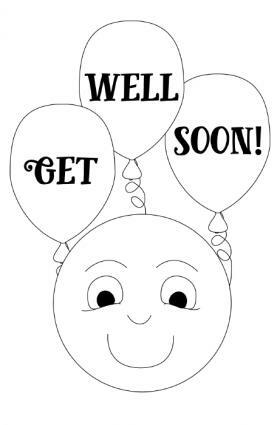 The following get well cards for kids are free to download and print using Adobe Acrobat. After printing, fold the card in half and color. For help, check out this guide for Adobe printables. 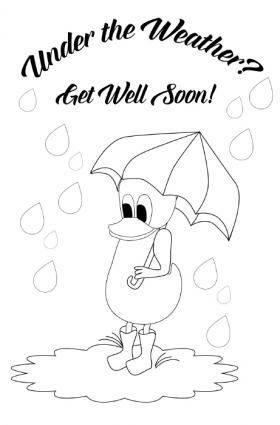 This card features a duck who is "under the weather" standing in the rain with an umbrella. It's a great option for kids to give to adults or older kids. The sentiment reads, "Get well soon!" Click to print this card. Kids love puppies, so they'll love coloring this card. 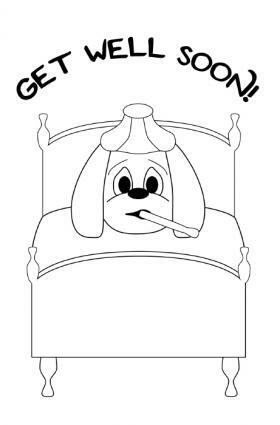 It features a puppy in bed with a thermometer in its mouth with the message, "get well soon!" It's a great card for kids to give to other kids. What better way to brighten a sick child's day than a colorful smiley face? This card is perfect for kids to give to their friends thanks to its happy face, cheerful balloons, and "get well soon!" message. It doesn't matter how old you are, a teddy bear is comforting when you're sick. This card is a nice choice for kids to give to mom, dad, or a grandparent. The sweet teddy bear on the card holds a bouquet underneath a smiling sun. The sentiment reads, "Hope You Feel Better Soon!" Few things can brighten up your day like a bouquet of flowers can. 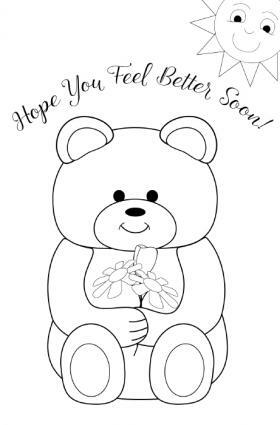 This card is great to color and give to grandma or an older friend who is feeling under the weather. Print on colored card stock. Add bling with glitter and sequins. Use markers for vivid color. Paint with watercolors or tempera paints. Use rubber stamps to add a decorative border. Don't just decorate the outside of the card. 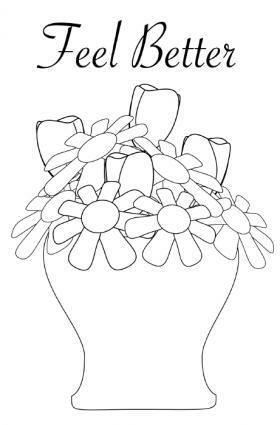 Use the inside to create original drawings or add additional get well wishes. Hole-punch the top and add a yarn or ribbon bow. When someone they care about is unwell, kids often feel helpless. Coloring a get well card helps empower them and allows them to play an active role in the recovery of a family member or friend. It also helps teach compassion for those who need a pick-me-up.